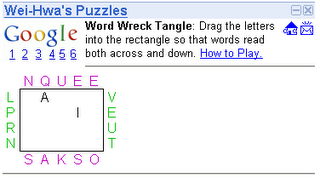 Word Wreck Tangle: Drag the letters into the rectangle so that words read both across and down. Purple letters only move up-and-down, while green letters only move left and right. Click and drag a colored letter to move it. You win if four five-letter English words read left-to-right along the rows and five four-letter words read down along the columns.